With well over 100 Snowy Owls thus far reported in Ohio - biggest irruption in many decades - interesting stories are bound to arise. These birds draw lots of attention, and nearly everyone who has the fortune of seeing one is suitably impressed. An upshot of the owls' conspicuousness and popularity is that we get lots of reports from people that aren't in the birding network. That allows a better tally and more thorough documentation of an invasion (to use a much overused descriptor) that we aren't likely to see on this scale for decades, if history is a guideline. One downside, for the owls, is that nearly all of them are juveniles, and utterly unfamiliar with vehicles. Couple that naiveté with their propensity to hunt near roads, and fly close to the ground, and owl-vehicle strikes will happen. 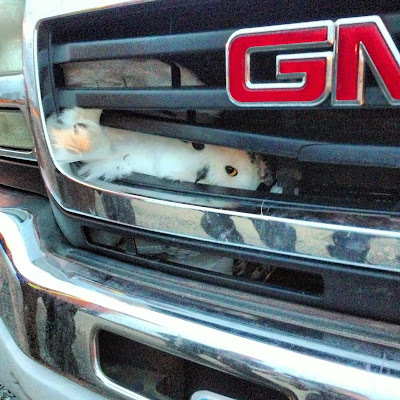 I've heard of at least four cases of Snowy Owls killed in collisions with vehicles so far, and some say that this is the biggest cause of mortality for owls south of the breeding grounds, at least in populous areas. So, when I first saw these photos, I was bummed - another owl gets grilled. But a quick skim of the email they were attached to reveals a happy ending, it seems. 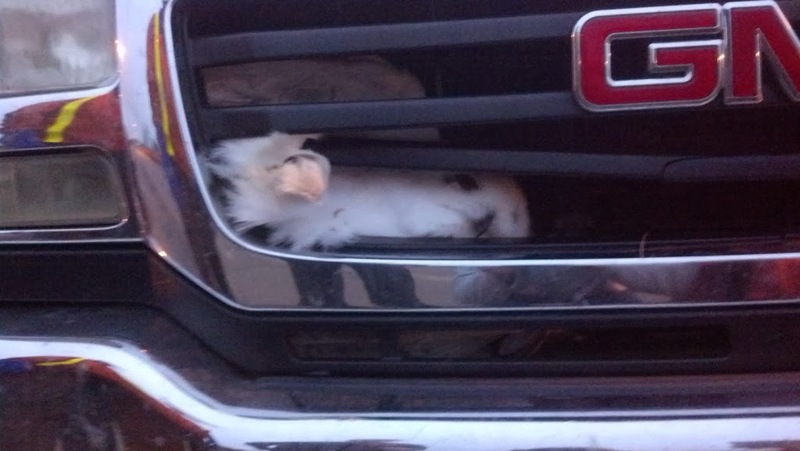 The gentleman was driving along a rural Wood County road when the owl came out of nowhere and bashed into the front of his pickup truck. The collision was hard enough to crack one of the slats in the grill - these birds can weigh 4-5 lbs, or more - and the owl popped right through and was stuck between the grill and the engine compartment. But it is still alive, and fortunate indeed that the right guy was driving the truck. The driver quickly worked the owl free, and placed it on the passenger seat in the warm cab of the truck. While the bird was undoubtedly a bit dazed and confused, and some feathers appear out of place, it doesn't look too worse for the wear. Anyway, while the guy was no doubt pondering what to do with the animal, it shook itself off, and darted out the door. The driver reports that it flew strongly across the fields, and out of sight. Here's hoping it suffered no lasting damage. If it had to collide with a vehicle, it's probably good that it happened to be this one, as many people probably wouldn't have been able to deal with the situation rapidly, and successfully extricate the bird. 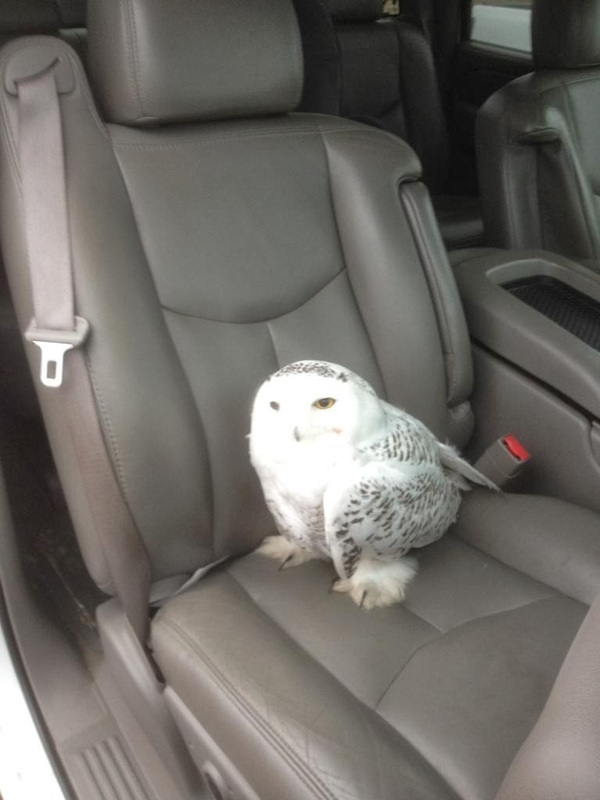 UPDATE: This same owl, apparently, is doing well and hunting in the same area, at least as of January 1. Look for it near the junction of South Dixie Highway and State Route 281 in Wood County, not far south of the town of Rudolph. This video comes from one of Ohio's prisons, and offers an interesting choice of habitats. The person who made the video reports that there are plenty of fields and wide-open habitats around the facility, and they are hopeful that the bird will stay for a while. It's pretty cool to see the big white owl cruise right over the concertina wire. Snowy Owls continue to turn up in new spots about every day, with at least 113 reported in 39 counties to date. An update and map are RIGHT HERE. 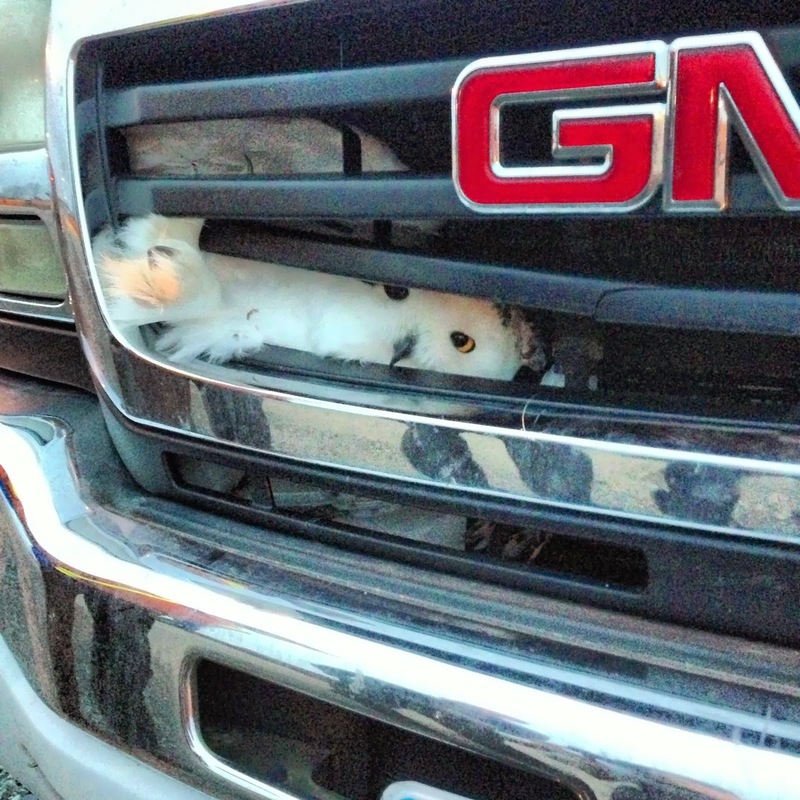 Amazing mini-set of images of the Snowy Owl in the truck grill. I am always impressed at the toughness of these creatures. Wow! great story/pics, and of course, amazing bird!